Pan Pacific hotel proudly rising 23 stories high, one of Vancouver’s 5 star hotels. The site was originally constructed in 1927 by the Canadian Pacific Railway and named Pier B-C. It became an important terminal for passenger ships to Pacific Rim destinations and for ferry service to and from Vancouver Island. 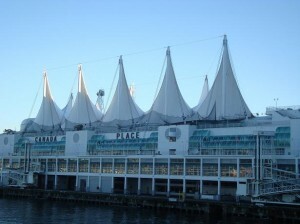 It was conveniently situated near the Canadian Pacific train station for easy transfer between train and ship. 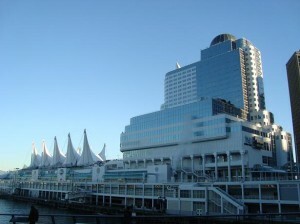 In 1987 the Canada Pavilion was converted into the Vancouver Trade and Convention Centre and officially turned over to the Province of British Columbia. It served as the main press center for the 2010 Winter Olympic Games. This iconic structure remains one of Vancouver’s most recognizable landmarks. This concludes a look at 12 significant buildings over a 100 years of architecture in Vancouver.